The Low Down: Jerome is always talking to Heidi Devine. It seems the only time she doesn’t hear him is when she’s sleeping. Heidi can’t remember a time that he wasn’t there…in her head. Her best friend, Megan, talks her into performing together at the school talent show. Which doesn’t go well. Even though Jerome warned her not to do it. Taking her dog, Jiminy, for a walk after the video of her unintentional mooning goes viral, she accidentally falls through the ice in a pond near her house. That’s when she finds out that hearing Jerome doesn’t mean she’s crazy; Jerome is her guardian angel. Except, if he were paying any attention at all, she wouldn’t have drowned. Well, he is in rehab, where he has a second chance to show that he deserves the Heavenly route and not being sent to one of the nine circles of Hell. If he can figure out what to do with her soul. I’m Cranky Because: Now there was no The Fault in Our Stars or The Perks of Being a Wallflower level of tissue using, but let’s just say I was up late reading and I was trying not to wake up the whole house with my honking nose blowing. I think I counted eight tissues that were beyond saving. Not that I save used tissues. That would be weird. Should You? : Yes! The previous 3 or 4 books I have read were more on the serious side, so this book came at the right time. While it is serious, the writing was funny and honest and believable and real. Though about death, it seemed light (but not frivolous by any means). A sneaky thinker – the kind of book where you realize when you’re finished that it really had something to say. 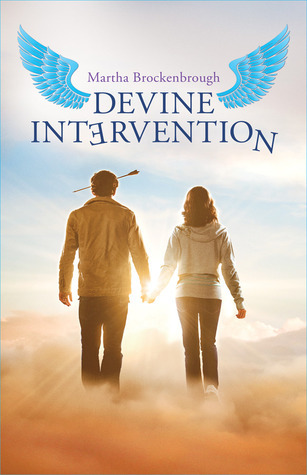 Devine Intervention by Martha Brockenbrough was published on June 1, 2012 by Arthur A. Levine Books. @InkandPage Oh, my goodness! Don’t you know how to make a writer’s day! Thank you (and you’re an amazingly fast reader). @InkandPage We’re so glad you enjoyed the book!